Card Size: 2-3/8" x 3-3/8"
These 2-3/8" x 3-3/8" premium clear vinyl horizontal badge holders are clip-on. 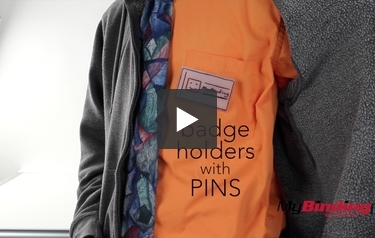 Durable and tear resistant with reinforced edges, these 2-3/8" x 3-3/8" badge holders easily attach to clothing with a rotating bulldog clip or pin. Get 100 with every order. Product number MYBP504PC. These are Badge Holders with Pins! Easily attach them to your clothes for a pocket display. There are two types, the non-rigid and the rigid. There are variations of pin type, too. This is the plain crimp pin. It’s held on to the holder with a strong, clear glue. To insert your card, open the holder and place it in. Then fold the front-cover top-edge over the back cover to hold your card in place. This is the pin/clip combo. You can use either attachment or both at the same time, and it also swivels around. This rigid design doesn’t have sides, so with lots of movement it could fall out, but generally if you don’t shake it you’ll be ok. Since the non-rigid has sides and loads from the top, it makes your card more secure. Look for some that even have holes in them, allowing the user to use a chain necklace instead. It gives you many options for personal preference—and three times the security if you really need it.